1. Sauce: In a bowl, whisk together Steve's Onion & Garlic Pepper Sauce, ketchup, water, vinegar, brown sugar, Worcestershire sauce, mustard, salt and black pepper to taste. 2. Meat Balls: In a bowl, combine gently the ground chuck, bread crumbs, salt, garlic, parsley, pepper, onion, horseradish and egg. Form level tablespoons of the mixture into meat balls. 3 .In a large, heavy skillet, heat olive oil over moderately high heat. 4. 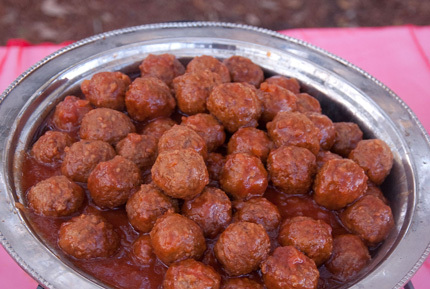 Brown the meat balls, turn the meatballs over often to maintain the round shapes.Using a slotted spoon, transfer the meat balls, as they are browned, to a paper towel to drain. 5. Drain the skillet; add 1 tablespoon butter (or leave 1 tablespoon of the olive oil in pan). Add the sauce to the skillet and simmer, stirring, for 1 minute. Return the meat balls to the skillet and simmer the mixture for 3 to 5 minutes, or until the meat balls are heated through. Makes about 36 meatballs.